Trackfest 2010 was held in Marshall, Michigan, with headquarters at Squaw Lake Farm, owned by John Walters. UBT hosted the event with the assistance of UBT Member, Don Dickerson. Not only did Don secure the beautiful headquarters property for our use, he was called upon to locate additional nearby training and tracking land due to the event being so well-attended. Twenty-six trackers participated in the event, with nine additional family members in attendance. UBT President, Andy Bensing (Pennsylvania), UBT Vice-President and author of Tracking Dogs for Finding Wounded Deer, John Jeanneney (New York), UBT Secretary, Cheri Faust (Wisconsin), UBT Director of Testing, Larry Gohlke (Wisconsin), and UBT Director, Alan Wade (Louisiana), served as instructors for the event. During the classroom portions of the event, UBT instructors spoke and gave demonstrations on topics, such as Blood Tracking as a Team, How to Lay Artificial Bloodlines, Working with Puppies and Adolescent Dogs, Training Techniques, and Weapons and Techniques for Putting Down Wounded Deer. UBT Member, Chuck Collier, gave a helpful update and explanation on the most recent tracking legislation in Michigan. Additional presentations included GPS Use in Tracking and a show-and-tell of tracking lights, leads, and collars. Twenty-two dogs of 10 different breeds or varieties received individual and group training during the field work sessions. The weather was nearly perfect for the weekend’s tracking events, with mild temperatures and partly cloudy skies. Participants got better acquainted while eating lunch catered by Marshall’s Cedar Crest Banquet Centre while seated in the shade at the picnic tables located on the property. A feast of swiss steak, cod almondine and baked pork chops was enjoyed at the Saturday evening buffet, with more chances to share tracking adventures and tales of “the big one that DIDN’T get away” (thanks to our wonderful tracking dogs). On the Monday following the two-day Trackfest 2010 event, evaluations were conducted for 15 dogs. While these evaluations are “pass/fail”, they provide invaluable feedback to trackers on the strengths and weaknesses of their handling techniques and help determine future training goals for the dogs. The criteria for passing the test is for the judge to determine, based on the performance that day, whether they would recommend the tracking team to their friends or family members if they needed help in finding a wounded deer. The UBT 1 evaluation is a 400 yard artificial trail with two turns and one wound bed. The track is aged at least 2 hours. 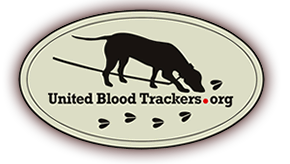 Eleven dogs were evaluated on UBT 1 tracks – ten on trails with 8 ounces of dripped blood, and one on a trail with 3 ounces of dripped blood in addition to tracking shoes with deer hooves attached. Eight of the ten dogs on blood-only tracks passed. The one dog on the hooves/blood combination track also passed. The UBT 2 evaluation is an 800 yard artificial blood trail with three turns and two wound beds. The track is aged over night, or at least 8 hours. One of the three dogs tested on the track with 8 ounces of dripped blood passed, and the one dog tested on a track with 3 ounces of dripped blood, in addition to tracking shoes, passed. As always, the weekend ended with new friends having been made, plans and goals for future training, and renewed enthusiasm for the next tracking season.